(February 8, 2017) POMONA, Calif. – Three-time NHRA Winternationals Top Alcohol Dragster champion Chris Demke is chomping at the bit to fire up his Peen Rite/Boost Performance Products dragster at the season-opening Circle K NHRA Winternationals this weekend. After finishing fifth in national points last year, Demke enters 2017 at his home race with his same trusty crew and sponsors, and a freshened chassis and new parts. Returning to Pomona with Demke is the full Maddern Racing team from 2016, headed up by Demke’s stepfather and team owner, Jerry Maddern, and car chief Kevin Watson. The team’s primary supporters from the last several seasons, Peen Rite and Boost Performance Products, are also on board for 2017 along with returning associate sponsors Hoosier Tire, VP Racing Fuels and Morningwood Energy Drink. “Brent Gines at Boost Performance Products is back with their great CleanBoost oil and other CleanBoost products. 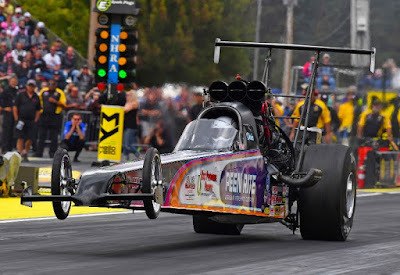 I’m happy that our supporters from last year have returned and have confidence in our ability to perform, put on a good show and represent them well,” added Demke, who won the NHRA Winternationals in 2010, 2012 and 2014. New for 2017, however, is the front half on Demke’s Uyehara-built dragster. The chassis was showing its age at the end of the 2016 season, so the Maddern team elected to front-half the car over the winter. All engine and transmission components were either freshened or replaced, as well. Chris Demke, driver of the Peen Rite/Boost Performance Products Top Alcohol Dragster, will take to the Auto Club Raceway at Pomona for the Circle K NHRA Winternationals Thursday, February 9, at 4:45PM PST for the opening round of qualifying. Qualifying will continue on Friday, February 10, at 2:15PM PST, followed by a third and final qualifying session on Saturday, February 11, at 10:30AM PST. First round of eliminations is scheduled for 2:30PM PST on Saturday. Eliminations continue on Sunday, February 12. Maddern Racing is a family-owned and operated NHRA Top Alcohol Dragster team based in Southern California. The team's Chris Demke-driven Peen Rite/Boost Performance Products blown alcohol dragster is owned by Jerry Maddern and crewed by Kevin Watson, Aimee Maddern, Mike Demke, Greg Rice, Robert Hadaller, and Ryan Miller. For information on Chris Demke and Maddern Racing, please visit www.maddernracing.com and www.facebook.com/maddernracing. Maddern Racing receives support from the following companies: Peen Rite Inc., Boost Performance Products, B-G Detection, Afco, LA X-Ray, Hoosier Racing Tires, VP Racing Fuels, and Morningwood Energy Drink. Good luck this season guys!